In spite of the enormous amount of work I have to do these days, I find some time for at least tasting the wind. Last Sunday I was on island Pag. Jugo (south wind), 20-30 knots. I was expecting less, so I took a bigger board and sails. However, new Fanatic Blast 130 and NP Speedster 7,2 worked perfectly in those conditions. 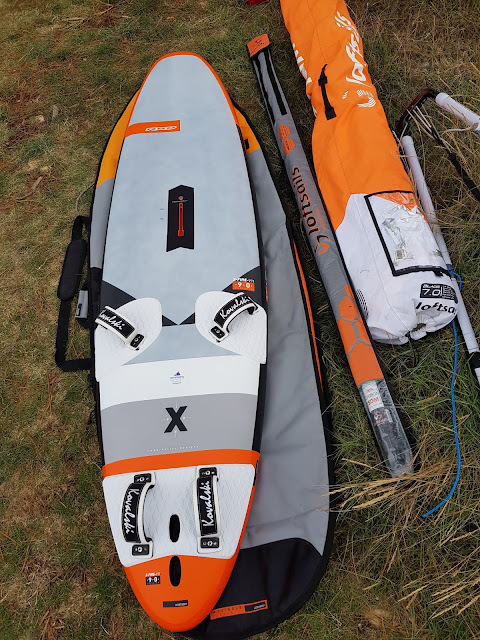 New RRD XFire V11 looks amazing! I thought that last year colour design (V10) was unbeatable, but this is even better! Can't wait to test it (no doubt that it works perfect!). This is a kind of a miracle. Goran Jablanov (47 years old), a windsurfer from Slovenia, went windsurfing on Monday (29.10.2018.) with two friends trying to challenge hurricane scale south wind. They started in north Istria spot (Croatia), just to find out that they overestimated their strengths. Two of them succeeded to come back on the shore, but Goran didn't. Apparently, his sail was torn in pieces. The search for him went on over the night and during the next day. In the afternoon almost all hope was lost. However, that evening Goran called his wife, and the ambulance, of course, from the beach bar on Costa del Barbara, Italy! 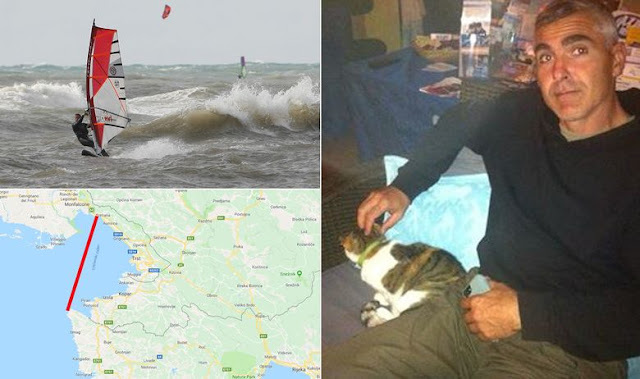 That is 19 kilometers from Trieste, and 40 kilometers from the point of entrance in the sea (look at the map above)! 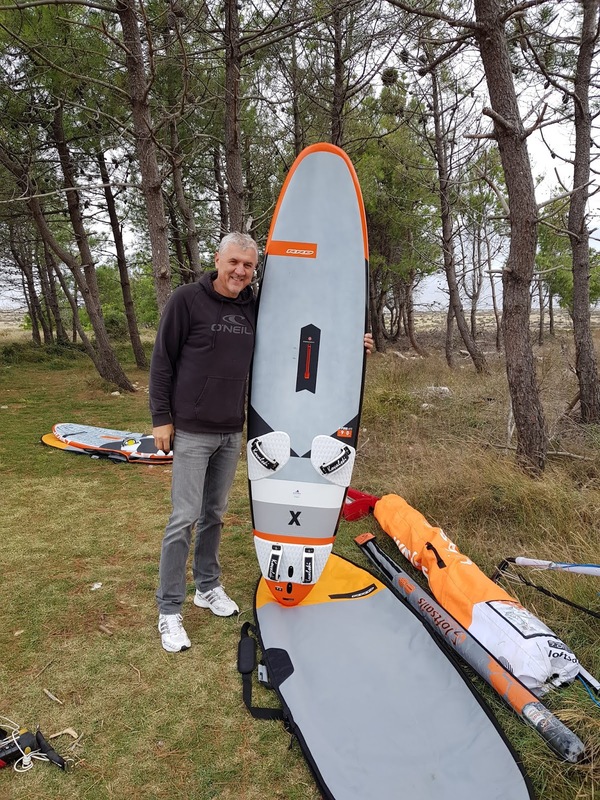 As an experienced windsurfer, he didn't let go of his board. The sea was unusually warm for this time of year, and he has a winter neoprene suit. Nevertheless, 26 hours and 40 kilometers swimming on the rough sea! That is something to remember. No serious injuries for Goran, just extortion and dehydration. He is already well, waiting for the next windsurfing session. Take care, Goran. We are all relieved that you are safe and sound. That was one lucky adventure, but safety first is always the best policy. Sometimes the wind is just... too strong. My Greek summer 2018 was almost two months long. 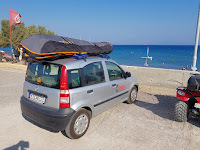 I've been on usual places (nothing special to report, but usual bliss :-) ), except for two weeks at the beginning of August when I decided to explore well-known windsurfing spot Kefalos on island Kos. It is a beautiful place, dedicated to windsurfers. If I have to describe it shortly, I would say it’s a freeride heaven. Kefalos bay is on the south side of the island, some 15 minutes drive from the airport. The wind is mostly offshore. It’s some kind of combination of Meltemi and local thermal wind. 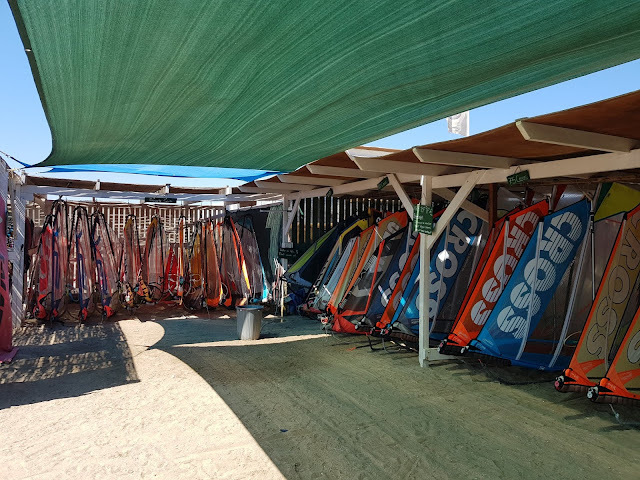 From 14 days, I had 12 days of windsurfing. 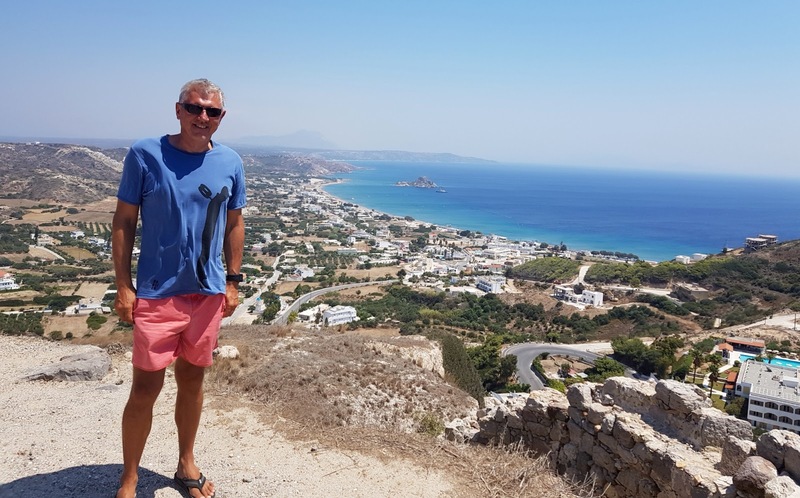 One of those missed days I spent on an excursion to Nysiros, a volcanic island near Kos. I did it because the forecast was quite bad wind wise. However, when I came back I was informed that the wind was perfect! 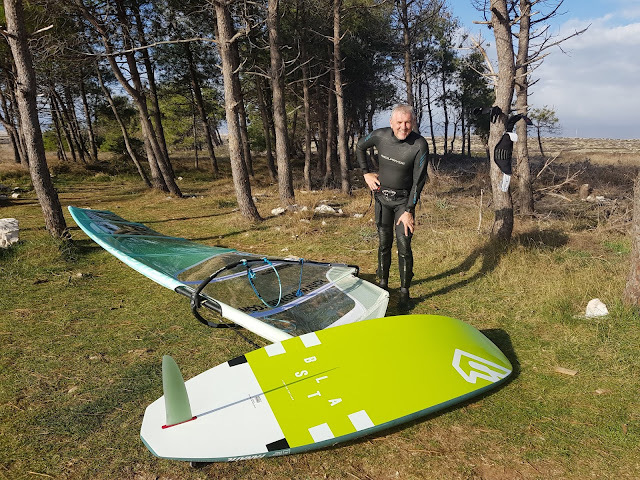 Pity for me, but good for windsurfers: even when the forecast says no wind, you can nevertheless stay on the spot and windsurf! For someone like me, used to strong winds of Karpathos, Kefalos is aquite gentle spot. I made a misjudgment in equipment and took with me 98lit slalom board and 7,0 slalom sail. The sail could be appropriate, but the board was most of the time too small. If I would go again, with a choice of one board and one sail, I would take 110-120 lit board and 7,8 sail. Just for comparison, I had some great sessions on 130 lit freerace board (Fanatic Blast) and 7,0 no cam freeride sail. The whole bay is 2,5 km long, with sandy beach. Hotels, apartments, and taverns are right there, along the beach. There are few places where you can access the beach by the car (if you have your own equipment). For renting there are two centers. 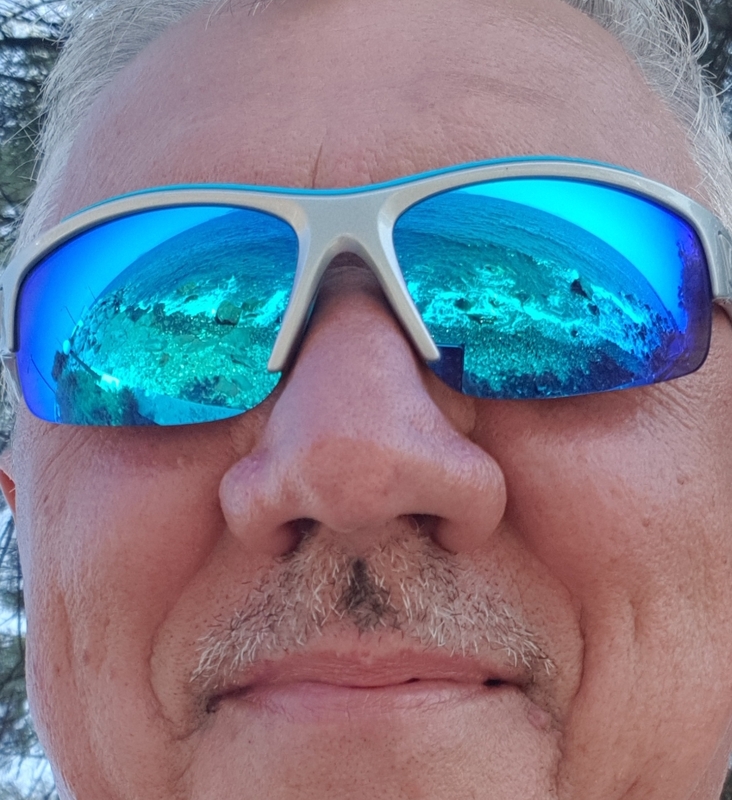 One is KEFALOS WINDSURFING CENTER. It is well equipped with Fanatic and Patrik boards, mostly freeride but all kind, actually. They are quite new, so you can choose whatever suits you best. Sails are abundant too, all Sailloft (German brand; don't confuse that with LoftSails - it is something quite different). On the days without the wind, or in the morning, you can SUP or kayak. They have two hydrofoils, and one old tandem board, so you can try that too. Slalom equipment... well, there are some older boards (Fanatic, Patrik, and F2) and even older sails (again Sailloft), but I must say, if you can't bring your own, don't rent slalom - you will not be happy. Instead, relax and enjoy freeride. The staff is very friendly, and the overall atmosphere is relaxed, so you can really enjoy the turquoise water and nice winds of Kefalos. 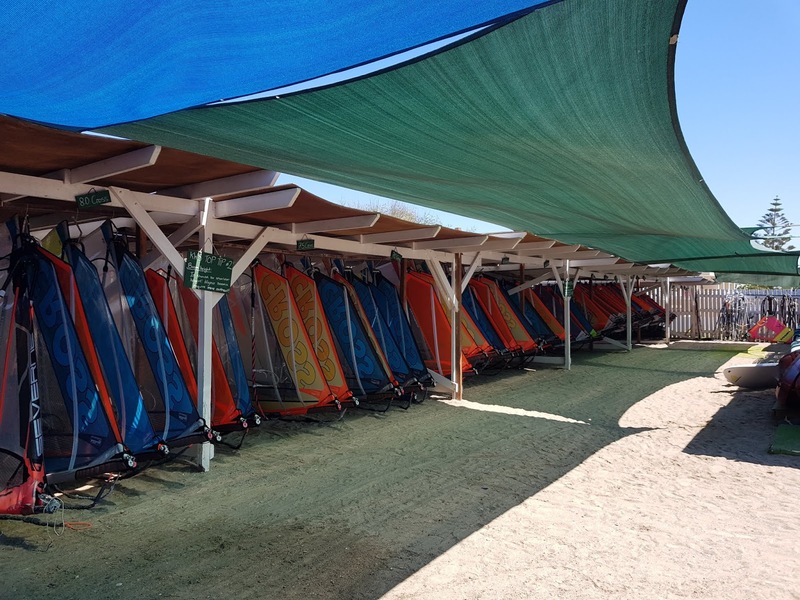 The second windsurfing center in Kefalos bay is Russian operated VETRATORIA with all RRD equipment (boards and sails). I like how they handle all-prevailing sand: there is a water shower in front of the Center. You wash the board and the sail, and all equipment is inside under the roof (that's unusual for a windsurfing center). The floor is clean and you have a feeling that you are in the windsurfing store, not the equipment storage for renting. Nicely done, Vetratoria. Almost everyone. It is not for you if you are high wind addicted fanatic. 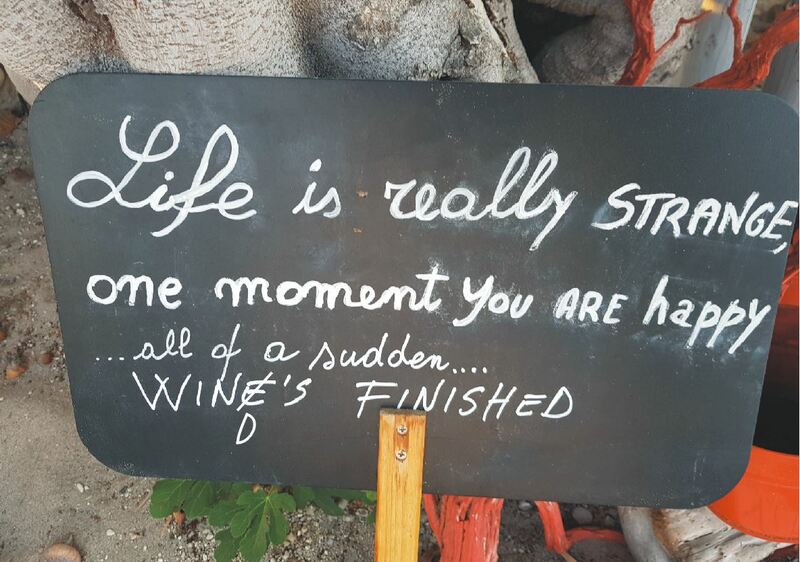 Otherwise, in Kefalos you can windsurf with all level of skills. Beginners have first 50 meters where the wind is light and you can make your first steps without too much trouble. Of course, rescue boat is in frequent use, but no worries: if the offshore wind takes you too far, they will come for you with the smile on their faces. The same is valid for intermediates who can nicely practice planning, footstraps, and harness on the gentle breeze (13-17 kt) if they let themselves go for another 50 meters out. And then, even further offshore, you can find more constant and stronger wind, up to 20 kt. I was impressed with the space you have. In spite of high season (beginning of August), and quite a lot of people on the beach and actually windsurfing, I never had a feeling of being squeezed by others. Quite a contrary, the area in front of the harbor, where the wind is the strongest, is so big that mostly I had a feeling of being alone on the water. And, if you want even more space, you can go even further out (some 300 meters or more from the shore). If you don't mind little chop and small waves you can have a blast for more than 5 km in one direction. All alone, if that's your thing. The beach is perfect for taking some sun, swimming in clear water, or reading a good book under a sun umbrella (you have to pay for it, but you don't have much choice because you will not find any shade on the beach). Kitesurfing is forbidden in Kefalos bay, but there are plenty of north side beaches with Kite Centers. There, the wind is onshore and you can have some nice waves to enjoy. The old town Kos is worth visiting (some 45 minutes’ drive from Kefalos). It has some Turkish influence in the architecture and overall feeling. The tourists are all over the place, but I liked the fact that there is 13 kilometers of bicycle tracks in the very city of Kos. By the way, the island is very nice for bicycle riding. A lot of small roads to explore, with the just right level of difficulty (not too extreme, not too easy). Of course, I have to mention my gastro-hedonistic exploration of every Greek island I've been so far. Taverns on Kos are good, but they don't offer something special. You can have a good, decent meal in each one of them. So, the good news is that you cannot make a mistake. However, they lack the originality of taverns I came across on Crete, Naxos, Lefkas or Karpathos. They are more like fast food restaurants, and that was especially disappointing on island Nysiros, where I just could not find nothing greekish in those taverns. Burgers, French fries, and such staff. A pity. However, one restaurant made up for all shortcomings. The name is "Platanos", located in the center of old town Kos, right beside the old plane tree (Platanus), where Hippocrates gave his lectures thousands of years ago. Platanos offers a celebration for most delicate taste. It is an original Greek restaurant, but with the just right touch of originality and modernity. The flavors are amazing; the fusion of tastes explosive! 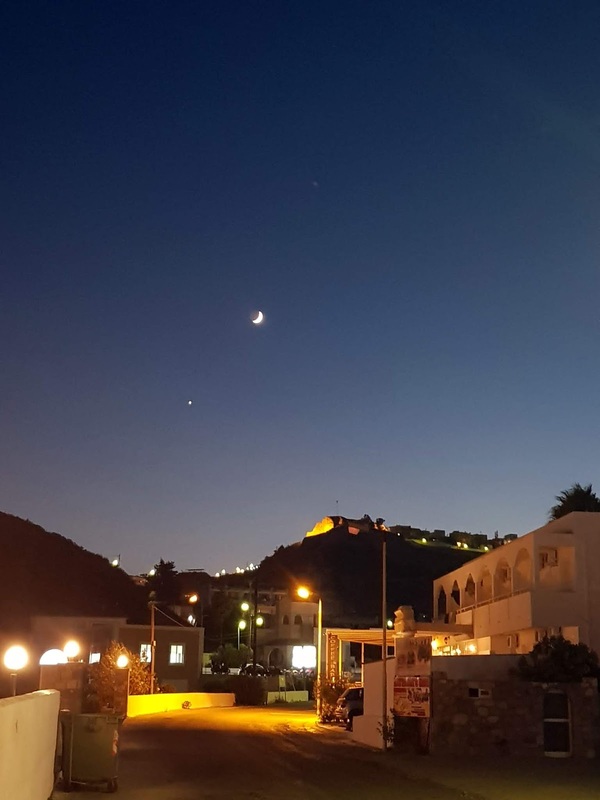 We were eating there a couple of times, just to make sure that Platanos is highly on the list of my favorite Greek island restaurants! I highly recommend it. Probably. 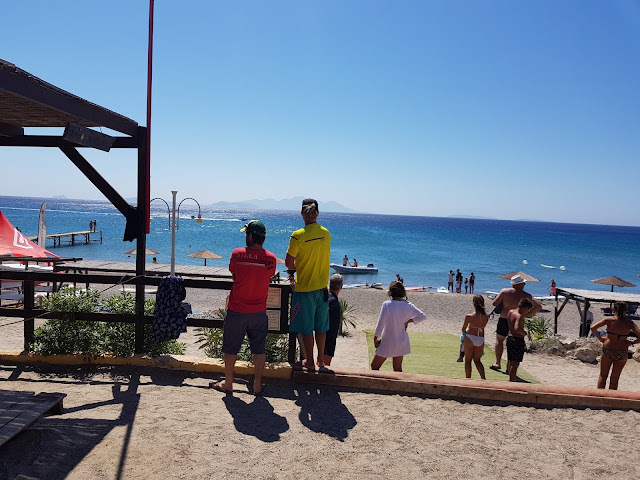 Kefalos offers a nice mixture of the reliable summer wind, easy relaxed feeling, here and there some high wind slalom and speed windsurfing, together with a chance to explore Greek island with exotic taste in it. 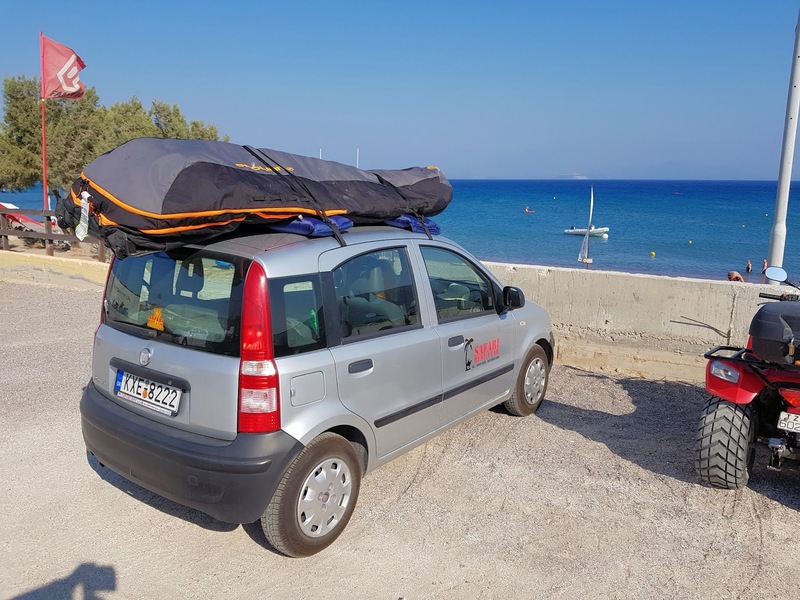 If you want an easy holiday where you can really enjoy windsurfing and at the same time to bring your family or non-windsurfing friends with you or those who wish to learn or improve, Kefalos is the right choice.